‘Joyalukkas Think Pink' to urge people to take the Pink Pledge with an increased drive to build awareness and educate on Breast Cancer. 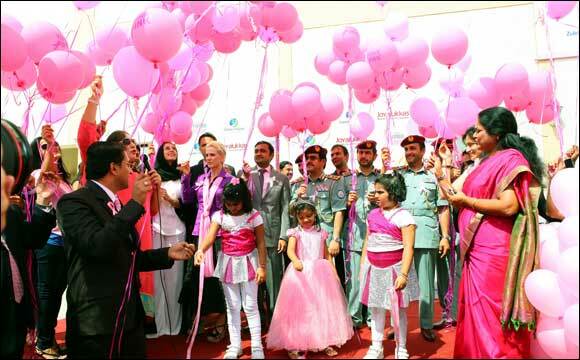 Sharjah, 7th October, 2013: The ‘Joyalukkas Think Pink' initiative, with the theme ‘Take a Pink Pledge,' launched once again this October is part of the Joyalukkas commitment to reinforce and build awareness of the fight against breast cancer. The mega CSR initiative is supported by the esteemed Zuleka Hospital and Dubai Health Authority. The Joyalukkas ‘Think Pink' campaign is a non-profit initiative with the single minded objective to educate and inform all on the disease. The month of October is celebrated world-wide as the month dedicated to building awareness, educating and empowering women on Breast Cancer. To complement the global drive, Joyalukkas launched ‘Think Pink' in the year 2011, as one of its main activities within its yearly CSR calendar. The Joyalukkas ‘Think Pink' initiative in association with Zulekha Hospital strives to drive awareness and educate society on the various aspects of breast cancer, including detection, via various media and in-store activities. “This year we are making an increased drive towards educating and empowering women since we have received a positive response over the last two years. I would like to sincerely thank the esteemed Dubai Health Authority for supporting this drive and helping us to extend our reach to more people and educate them on this disease. I would like to especially thank Zuleka Hospital for the support it has extended to us in our endeavor,” said Joy Alukkas, Chairman & MD, Joyalukkas Group. Unit and Leader, Developmental Therapeutics Program, UCSF Helen Diller Family Comprehensive Cancer Center. Several official dignitaries and eminent doctors from the field of breast cancer research were also present at the occasion. Under the ‘Joyalukkas Think Pink' umbrella, a mass media campaign will be launched to build awareness and educate women on breast cancer. The campaign will also include free breast consultation vouchers distributed at Zulekha hospital and a special educational booklet, distributed across the UAE, which will detail self detection methods in addition to key facts of the disease plus feature articles and quotes from reputed personalities in support of this grand initiative. Other than this there are special orientation programs planned in universities, schools Government offices and various Corporates across the UAE. “Our pledge to fight breast cancer has grown stronger with the overwhelming support and response we have received in the past two years, hence we have decided to further our activities under the ‘Think Pink' banner. As a Group, we are committed to take up causes that help and assist mankind and we hope we manage to reinforce the fight against breast cancer once again this October,” said John Paul Joy Alukkas, Executive Director, Joyalukkas Group. “As a healthcare provider we feel it is our responsibility to support and do everything possible that result in the health and well-being of people. The emphasis of the ‘Joyalukkas Think Pink' initiative is to build awareness about breast cancer and educate them on taking preventive measures. While women over 40 years of age are globally the most affected, younger women now are also being diagnosed with the disease, women as young as 19 to 30 have been diagnosed with breast cancer in the UAE. We hope ‘Think Pink' will add to the activities undertaken by various bodies to build awareness, educate and protect women” said Dr. Zulekha Daud, Managing Director, Zulekha Healthcare Group. Under the ‘Joyalukkas Think Pink' umbrella, various road shows and activities targeting women have been planned to give them a forum in which concerns and questions about breast cancer may be raised. Popular radio stations across the UAE will also be used as a medium to interact live with listeners, hear their stories and most importantly to educate and build awareness. About Zulekha Healthcare GroupZulekha Healthcare Group is one of the region's foremost brands for comprehensive healthcare. The group has healthcare facilities in Dubai and Sharjah, with their hospitals and medical centre chain in Dubai and Sharjah accredited by the Joint Commission International, College of American Pathologists for Lab services and Dubai Quality Award for Quality and Customer experience. Previous Story : DHA provides free access to Wi-Fi for patients and visitors.